Made in the UK, this Remarkable Toilet Company Floral cistern is the perfect addition for any bathroom, or WC. Traditional in design, adorned with bright bold flowers against an ivory background this cistern will bring a touch of class to any bathroom. An exclusive TRTC design available at an affordable price. The Burlington White Aluminium High Level Cistern has a traditional appearance, lovingly crafted and hand finished with exceptional care using the finest materials and manufacturing processes. 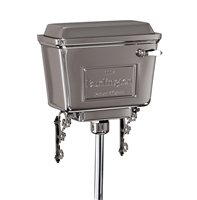 The Burlington Black Aluminium High Level Cistern has a traditional appearance, lovingly crafted and hand finished with exceptional care using the finest materials and manufacturing processes. Handmade by professional craftsmen in our UK workshop, this Remarkable Toilet Company High Level mahogany cistern is the perfect addition to any bathroom, or WC. Traditional in design and made from real mahogany, this cistern will bring a touch of Victorian style to any bathroom. An exclusive TRTC design available at an affordable price. Handmade by professional craftsmen in our UK workshop, this Remarkable Toilet Company High Level Straight Edge Wooden cistern is the perfect addition to any bathroom, or WC. Traditional in design and made from real wood, this cistern will bring a touch of Victorian style to any bathroom. An exclusive TRTC design available at an affordable price. The Straight Edge Cistern is available in Oak, Mahogany or painted in a range of Farrow & Ball colours. Hand finished in the UK, this Remarkable Toilet Company Satin Black cistern is the perfect addition for any bathroom, or WC. Traditional in design, whilst its black colour echoes the style of the Edwardian and Art Deco periods, this cistern will bring a touch of class to any bathroom. An exclusive TRTC design available at an affordable price. 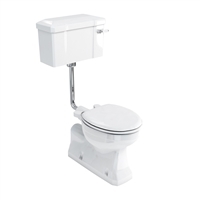 This Remarkable Toilet Company white left handed high level cistern is the perfect made to order addition for any bathroom, or WC. Hand finished in the UK, this Remarkable Toilet Company cream/ivory cistern is the perfect addition for any bathroom, or WC. Traditional in design, whilst its ivory colour echoes the style of the Edwardian and Art Deco periods, this cistern will bring a touch of class to any bathroom. An exclusive TRTC design available at an affordable price. The Burlington White Ceramic High Level Cistern has a traditional appearance, lovingly crafted and hand finished with exceptional care using the finest materials and manufacturing processes. The Burlington White Ceramic High Level Cistern Single Flush has a traditional appearance, lovingly crafted and hand finished with exceptional care using the finest materials and manufacturing processes. The Burlington White Ceramic Cistern 440mm with Front Push Button has a traditional appearance, lovingly crafted and hand finished with exceptional care using the finest materials and manufacturing processes. The Burlington White Ceramic Cistern 510mm with Front Push Button has a traditional appearance, lovingly crafted and hand finished with exceptional care using the finest materials and manufacturing processes. The Burlington White Ceramic Cistern 440mm with Ceramic Lever has a traditional appearance, lovingly crafted and hand finished with exceptional care using the finest materials and manufacturing processes. The Burlington White Ceramic Cistern 510mm with Ceramic Lever has a traditional appearance, lovingly crafted and hand finished with exceptional care using the finest materials and manufacturing processes.